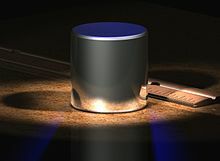 The International Committee for Weights and Measures (CIPM) approved a proposed redefinition of SI base units in November 2018 that defines the kilogram by defining the Planck constant to be exactly 6966662607015000000♠6.62607015×10−34 kg⋅m2⋅s−1. 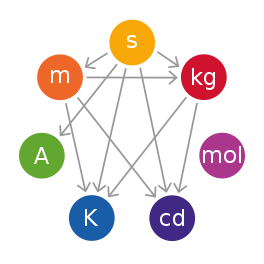 This approach effectively defines the kilogram in terms of the second and the metre, and will take effect on 20 May 2019. The hectogram (100 g) is a very commonly used unit in the retail food trade in Italy, usually called an etto, short for ettogrammo, the Italian for hectogram. The former standard spelling and abbreviation "deka-" and "dk" produced abbreviations such as "dkm" (dekametre) and "dkg" (dekagram). The abbreviation "dkg" (10 g) is still used in parts of central Europe in retail for some foods such as cheese and meat. ^ Proceedings of the 106th meeting (PDF). International Committee for Weights and Measures. Sèvres. October 20, 2017. ^ Milton, Martin (November 14, 2016). Highlights in the work of the BIPM in 2016 (PDF). SIM XXII General Assembly. Montevideo, Uruguay. p. 10. ^ Wood, B. (November 3–4, 2014). "Report on the Meeting of the CODATA Task Group on Fundamental Constants" (PDF). BIPM. p. 7. [BIPM director Martin] Milton responded to a question about what would happen if ... the CIPM or the CGPM voted not to move forward with the redefinition of the SI. He responded that he felt that by that time the decision to move forward should be seen as a foregone conclusion. ^ a b Stock, Michael; Barat, Pauline; Davis, Richard S.; Picard, Alain; Milton, Martin J. T. (March 24, 2015). "Calibration campaign against the international prototype of the kilogram in anticipation of the redefinition of the kilogram part I: comparison of the international prototype with its official copies". Metrologia. 52 (2): 310–316. Bibcode:2015Metro..52..310S. doi:10.1088/0026-1394/52/2/310. ^ Gutfelt, Bengt; Johansson, Mathias; Nyfeldt, Per; Pendrill, Leslie (2014). 13th Comparison between the Swedish national kilogram and SP principal standards for one kilogram (PDF). Borås: SP Technical Research Institute of Sweden. p. 3. ISBN 978-91-87461-72-9. Retrieved May 12, 2017. ^ Z.J. Jabbour; S.L. Yaniv (January – February 2001). "The Kilogram and Measurements of Mass and Force" (PDF). 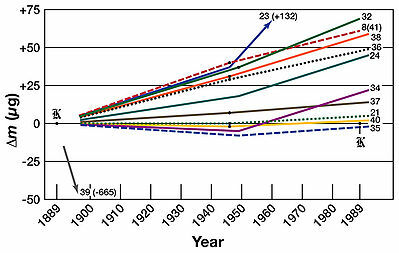 Journal of Research of the National Institute of Standards and Technology. 106 (1): 25–46. doi:10.6028/jres.106.003. PMC 4865288. PMID 27500016. ^ R. S. Davis (July – August 1985). 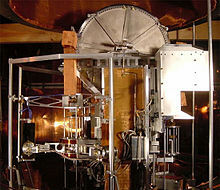 "Recalibration of the U.S. National Prototype Kilogram" (PDF). Journal of Research of the National Bureau of Standards. 90 (4): 263-281. ^ Pallab Ghosh (November 16, 2018). 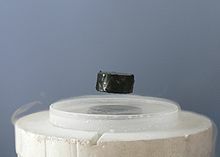 "Kilogram gets a new definition". BBC News. Retrieved November 16, 2018. ^ a b "BIPM - Resolution 1 of the 25th CGPM". 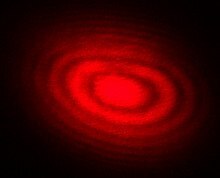 www.bipm.org. Retrieved March 27, 2017. ^ Lim, XiaoZhi (November 16, 2018). "The Kilogram Is Dead. 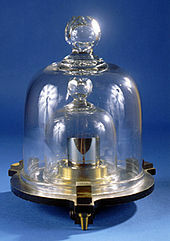 Long Live the Kilogram!". The New York Times. Avogadro’s constant and the Planck constant are intertwined in the laws of physics. Having measured Avogadro’s constant, Dr. Bettin could derive the Planck constant. And with a precise measure of the Planck constant, he could validate the results of Dr. Kibble’s work, and vice versa.